New Wayans Brothers movie Dance Flick is using a Facebook Fan Page (with vanity URL) as the hub for their online promotion. Traditionally theatrical releases would use ads to drive traffic to a microsite, but we are starting to see social networks used as the hub for release activity (like Bruno previously) and this is an interesting development. Dance Flick actually have 2 Facebook fan pages. 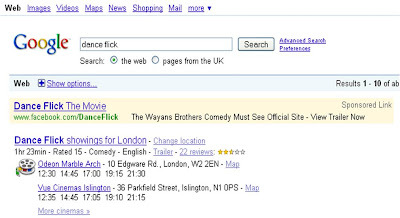 For the US www.facebook.com/danceflick, but for the UK www.facebook.com/funnydance - with both of these pages showing up on Facebook Search and looking very similar. 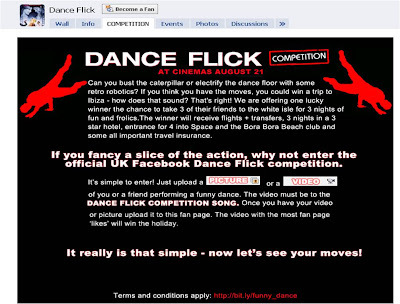 So not only are Dance Flick driving to a personalised Facebook address, but Dance Flick have created different Fan Pages (and content) for US vs UK. Other brands could learn from this. Rather than just having one global Facebook Fan Page, having an individual Fan Page for each country gives greater opportunity to localise content and make it more relevant for the audience. Promoting the Fan Page in local market advertising is also worth exploring. This seems to be the direction that brands are heading in when trying to capitalise on the Facebook opportunities (create Facebook page, drive traffic to page, maintain ongoing relationship with consumers) - if this continues then microsites could well be consigned to history.